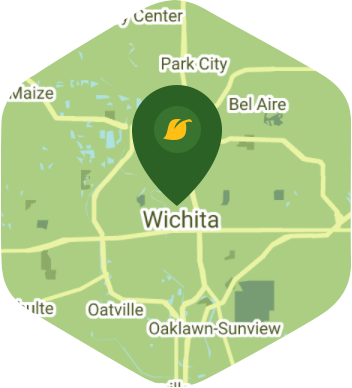 Book a skilled lawn pro in Wichita. Backed by a total satisfaction guarantee and amazing customer support. Kansas is often associated with livestock and farms, and while the state has plenty of them there is more to it than that. This is something that Wichita natives can proudly attest to. From the Old Cowtown Museum to Veterans Memorial Park, Wichita is a place that is simply full of awesome attractions. Living here is a blast and something that you're proud of. During the weekend you look forward to relaxing at home, but you might not be able to do that if your lawn needs some aerating done on it. Lawn aeration is one of our many specialties and we have a crew of independent lawn pros who are all ready to handle this task. We are all about giving you results, and with our help we are confident that we can give you a lawn that you can be proud of. We use a special aeration machine to bore evenly spaced holes on your soil which allows sunlight, water and other nutrients to penetrate all the way to the grassroots. This will lead to your lawn looking greener and lusher. There is no lawn too big or too small for Lawn Love, so let us handle your lawn aeration needs. Call us now at 316-218-9454. We can also send you a free two minute quote so you can check our rates. Wow! Awesome job! I love coming home to a GREAT looking lawn. Jay has done a great job.. very pleased! Thank you for addressing my concerns. The lawn looks great. Brandon did a very good job. He said is was going to come back today to finish the job. I haven't heard from him yet. Considering the shape my yard was in, the job done was great. Thanks. Great job, lawn looks great! Thanks Brandon. Cleaned all the overgrowth and did a great job with the lawn and shrubs! I did not engage with my service provider but I am pleased He does everything expected to keep my lawn in great shape thanks! Rated 4.85 / 5 stars in 52 Wichita customer reviews. There won't be any rain in Wichita today, which means you'll probably have to water your lawn. Dusk and dawn are the best times to water your lawn (the sun will rise at 6:51 AM and set at 8:06 PM today in Wichita). Here are some average aeration prices for homes in Wichita.